Customize your backyard grilling experience with the "Landon" Grill Island Project by Leisure Select! 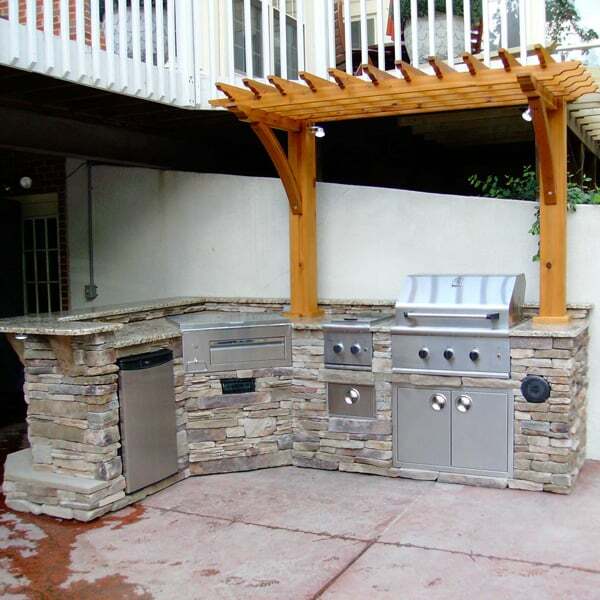 Imagine summertime cookouts with this stunning Grill Island with a special Pergola on your porch or patio! With a built-in gas grill and stereo system, smoky smells and wonderful music will drift through the air, entertaining and entrancing visiting neighbors and guests! Our Outdoor Rooms are customized by each homeowner to match the space, with a nearly endless array of stone, tile, granite and wood materials to choose from. Swap out this custom stone for North Shore Limestone or Olive Grove Ledgestone or the custom granite for an Absolute Black Granite or tile that matches your home's exterior. So unleash your imagination upon your backyard! Contact us today and ask about the "Landon" Grill Island Project form Leisure Select!